On Sep. 30, once-beaten Milorad “Micko” Zizic will step back into the ring when he faces unbeaten John Vera inside of the Downtown Las Vegas Events Center. The Vera-Zizic clash will air on CBS Sports and serves also as the biggest date in Zizic’s career. Zizic (12-1, 6 KO’s) has been training in Las Vegas under the watchful eye of his trainer Eddie Mustafa Muhammad, as well as his father Veselin Zizic, who was a former amateur standout himself. Vera (14-0, 9 KO’s) is coming off of a sixth-round TKO victory over Joey Ruelas this past May and figures to be full of confidence coming into the match. 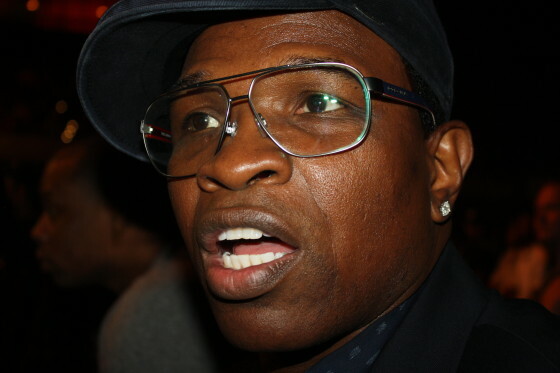 On Friday night, inside of the Cosmopolitan Las Vegas, Hustle Boss caught up with trainer Kenny Porter. 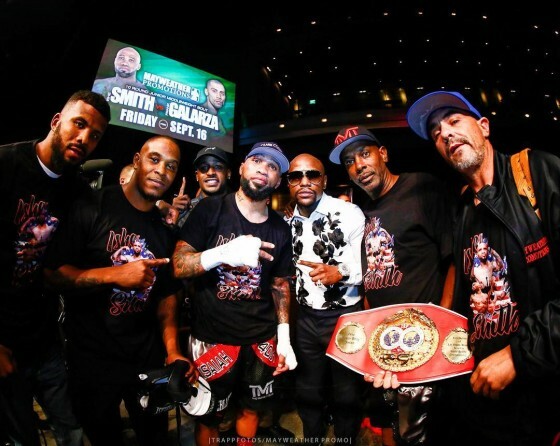 Kenny’s primary fighter, his son, former IBF welterweight champion Shawn, is coming off of a rousing performance this past June 25, where he dropped a razor-thin unanimous decision to WBA titlist Keith Thurman. On Friday night, Sep. 16, light heavyweight contender Lionell “Lonnie B” Thompson got back in the winner’s circle with a clear-cut eight-round unanimous decision over Chicago’s Donovan George. Thompson (17-4-1, 10 KO’s) was too sharp and agile for George (25-6-2, 222 KO’s), and registered a knockdown late in the match before claiming his victory. Watching from ringside, amongst others, was Thompson’s promoter Floyd Mayweather of Mayweather Promotions. Mayweather defeated Andre Berto in September of last year and walked away from the sport afterwards, with no indication that he will be returning. Canelo Alvarez stops Liam Smith in the ninth; will dream match with Golovkin happen in 2017? On Saturday night, Sep. 17, Mexican superstar Saul “Canelo” Alvarez captured the WBO junior welterweight title from Liverpool’s Liam “Beefy” Smith via ninth round TKO inside of the AT&T Stadium in Arlington, Tex. Alvarez (48-1-1, 34 KO’s) was precise throughout the contest, building up an early lead off of his combination-punching and work to the body. Smith was a brave opponent in the face of such firepower, but was never able to get his game plan on track. Later tonight, inside of the Cosmopolitan of Las Vegas, former IBF junior middleweight champion Ishe “Sugar Shay” Smith will return to the ring when he faces contender Frank Galarza on a Premier Boxing Champions card aired by Bounce TV. 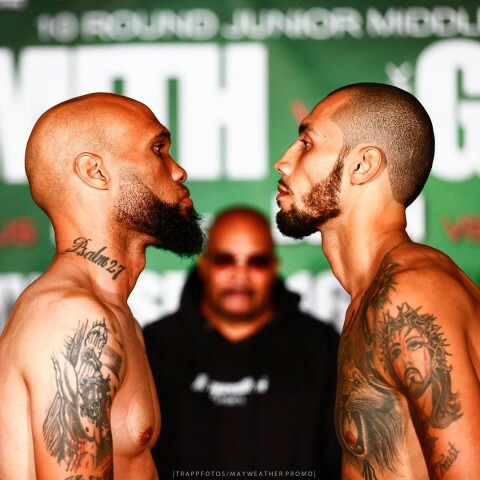 It’s the first bout for Smith (28-8, 12 KO’s) since his December victory over Tommy Rainone. Galarza (17-1-2, 11 KO’s) too will be retruning from a layoff, as he suffered his first loss this past November to Jarrett Hurd, who stopped him in the sixth round. This past Saturday, Sep. 10, offered up my first opportunity to witness unbeaten junior female flyweight prospect Seniesa Estrada in action from ringside as the East Los Angeles native battled Mexico’s Nancy Franco over eight rounds from within the Forum in Inglewood, Calif.
Estrada (8-0, 1 KO) offered up a master class performance in out-hustling Franco, a former IBF minimumweight champion, over eight rounds of action. Along the way, the 24-year old showed great movement, speed, and athleticism, clearly winning every round. 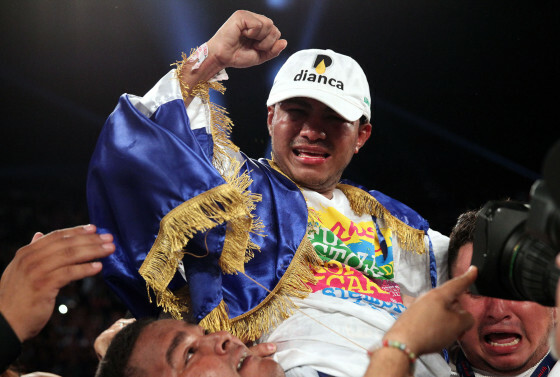 On Saturday night, Sep. 10, Nicaragua’s Roman “Chocolatito” Gonzalez overcame a spirited effort from former champion Carlos “Principe” Cuadras, winning a unanimous decision inside of the Forum in Inglewood, Calif.
Gonzalez (46-0, 38 KO’s) and Cuadras (35-1-1, 27 KO’s) gave the estimated 6,714 partisans in attendance a great show that including plenty of back-and-forth action. After 12 rounds of action, scores of 117-111, 116-112, and 115-113 were read in Gonzalez’s favor, as he captures the WBC super flyweight title, his fourth belt in as many weight classes. There didn’t seem to be too much tension in the air on Thursday afternoon, Sep. 8, as WBO welterweight champion Jessie Vargas (27-1, 10 KO’s) and eight-division world champion Manny Pacquiao (56-8-2, 38 KO’s) came face to face inside of the Beverly Hills Hotel in Los Angeles, Calif.
Vargas and Pacquiao will face off on Nov. 5, inside of the Thomas & Mack Center in Las Vegas, Nev.